If you are looking for a last minute Halloween decoration that is easy to put together and relatively inexpensive, this fun DIY Halloween wall art might be just what you are looking for. Michele created these fun images using photoshop and shares the steps with you, but you could use the same idea and create them with colored cardstock. I actually have a couple of giant poster size frames that I bought for another Halloween project that didn't work. I might be able to recreate these in a larger size if I can find some wrapping paper in the right color. 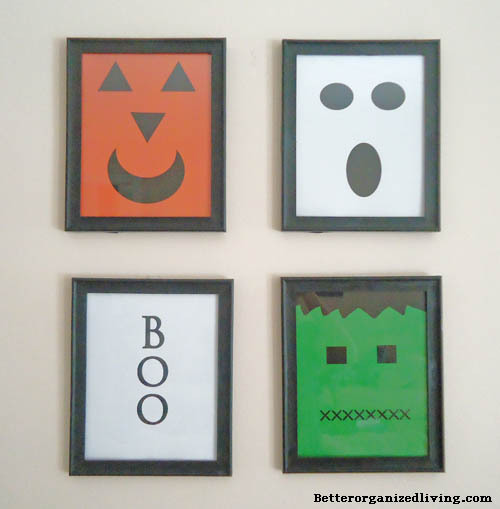 You can check out Michels's Halloween display and her fun Halloween wall art over at Better Organized Living. Really so beautiful and easy halloween wall art!